Lasfargues started out as a humble hamlet. Now extinct, it leaves behind just a handful of houses and a listed Cultural Heritage inventory - Château Lasfargues - the Maison de Maître (or Master's House). According to cadastral records, Louis Barsalou, a master tanner in Agen, owned the Lasfargues estate at the turn of the 19th century. The only visible remains of an original house can be found on a cast drain pipe on the southern facade embossed with "1796" - presumably during Monsieur Barsalou's ownership. The current building was erected on the site of the old house in 1861 (beautifully graced upon the tympanum grid of the grand entrance door), completed in 1863 for Auguste Barsalou, a merchant owner in Agen. The main gate at the entrance of the drive is decorated with the "AB" monogram. The Château is now a private secondary residence, and hosts vacation rentals and weddings throughout the year. 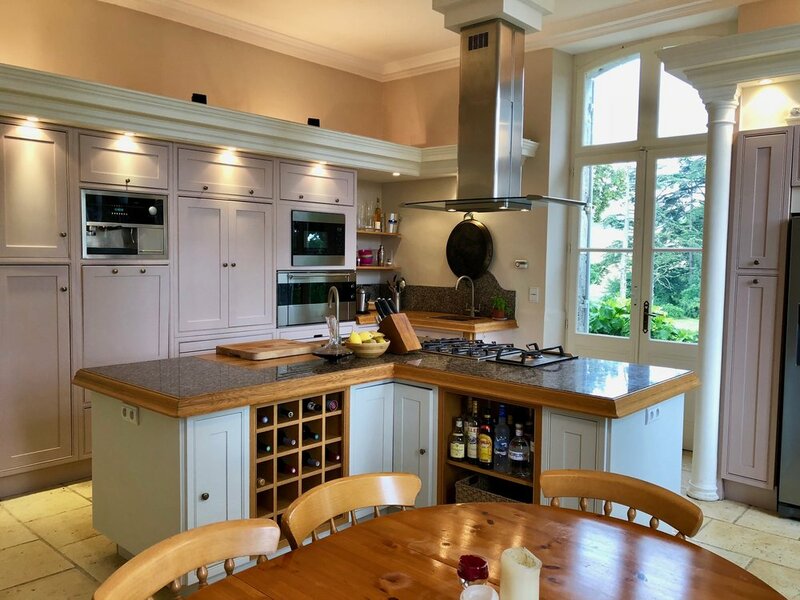 It boasts 8 large and luxurious en suite double bedrooms with space for up to 22 (including children), as well as extensive living accommodation which blends traditional french chic with fresh modern interiors. On the grounds you will find a private lake, hazelnut orchards and a heated swimming pool. Click here to view more images of the Château. L'Orangerie and La Fontaine, also located on the estate, offers further event locations and are contemporary with the main house.